Home › Australian › When Are We Going to Get Outraged About the Number of Aussie Women Killed by the Men Who Used to Love Them???? 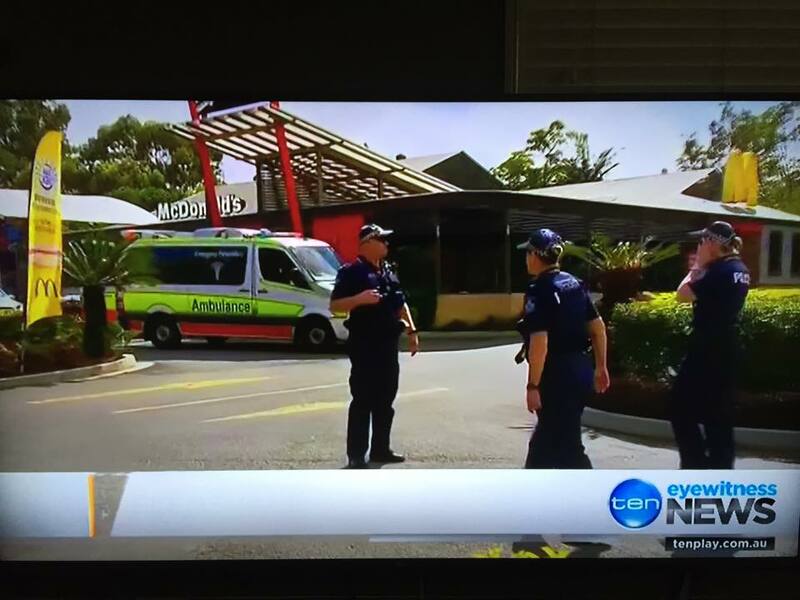 Today (10th September 2015) a man walked into Helensvale McDonalds and shot a woman in the head in front of customers, killing her (See Pic above).The woman was apparently his ex partner. She had already been shot in the back and had fled into McDonalds to seek help. He then turned the gun on himself and is now fighting for life in Hospital. 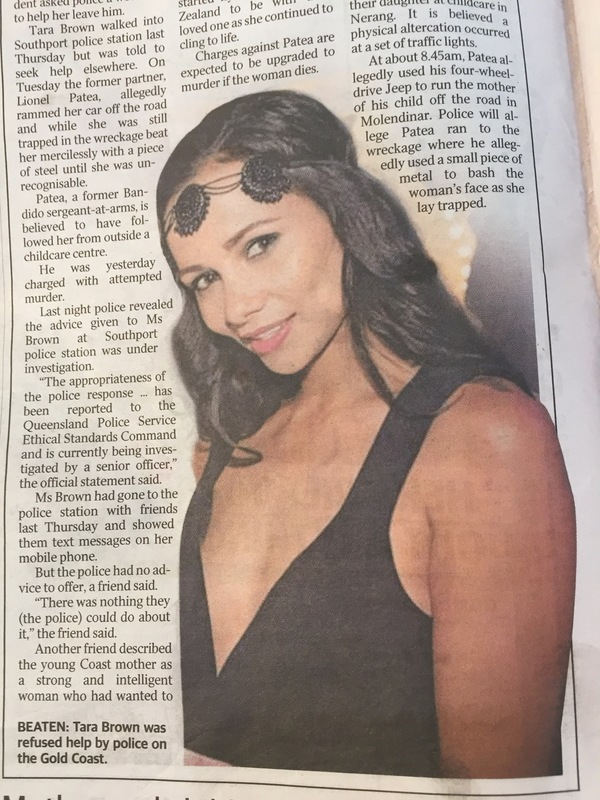 This morning a young Gold Coast mum, Tara Brown, died two days after her former partner ran her off the road and beat her (see Pic below). She had been to the police last week begging for their intervention but had been turned away after being told they could not help her. 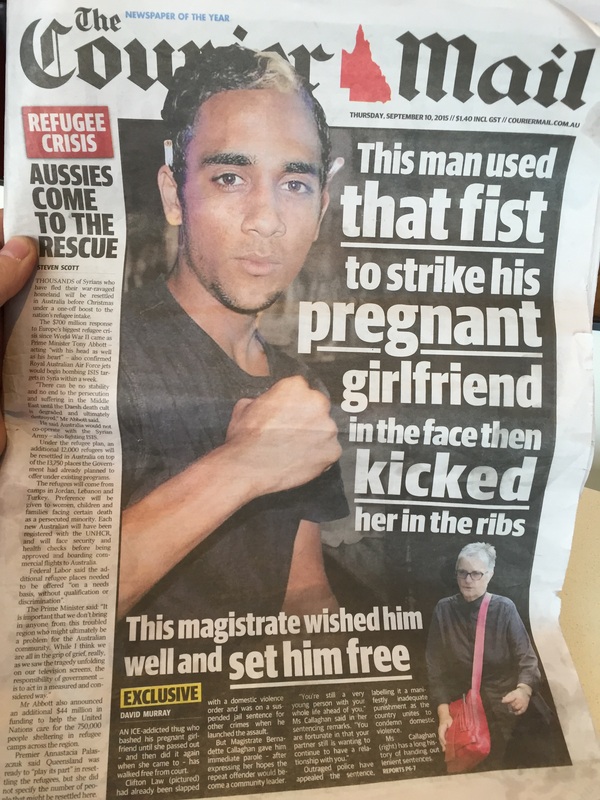 Today the front page of the Courier Mail (see Pic below) carried the story of a man who, high on ICE, bashed his pregnant girlfriend until she became unconscious and then when she came to, he did it again. And get this. He was on a suspended sentence for domestic violence. So what message did the justice system just deliver to the beaten women of Australia. The female magistrate wished him well and set him free. HE WAS SET FREE. When is the justice system of Australia going to start siding with our vulnerable women? There are 2 women a week killed in our nation by the men who used to love them. Ten News tonight reported that Queensland police receive 350 domestic violence related calls for help every single day. This is not ok!!!! Be outraged Australia about the way we are allowing our women to be beaten and killed. The police seem powerless to help and the justice system seems to be a revolving door for offenders that get a slap on the wrist and released. It’s time we got as outraged about this as we did about a little Syrian boy who drowned on a beach in Turkey. In my world Justice has a colour and its Pink. Peter. We should be outraged when ever a partner kills their spouse. We should be outraged whenever a parent kills their children. Remember, that 1 in 3 victims of intimate partner abuse, is a adult male. And that the majority of parents that kill their children, are the mothers. Craig benno, you are correct, men are abused by women too and should not be overlooked. I don’t know where you got your stats from, but men are the largest number in the murder of children, not women. If you read my comments more closely, I said the rate of mothers who kill their children, is higher then the rate of fathers who kill their children. Significantly so. Overall, yes, possibly more men kill children in general then women do. However, if you want to go down that track of overall violence, 1 in 3 women will face some form of violence in their lifetime, yet, the stat shows that 1 in 2 men will face violence. I don’t about the statistics regarding the numbers of males vs female perpetrators. What I want to know is why the police “could do nothing” for a terrified woman who calls in the police station for help? Surely they could have found her somewhere to go? I know domestic violence has reached frightening levels, but if the government is wanting to do something about this, surely they could begin providing safe havens, particularly for women fleeing from violent partners. It’s appalling! Peter, maybe the church could do something about this. And another thing, why are violent offenders being given a rap over the knuckled and released? If we need stronger legislation, then let’s do that too! The boy on the beach was NOT Syrian but Kurdish…running from ISIS! Please start rehabilitation processes for these men who choose violence. Prison is not the answer but there needs to be a consequence. As 1 who came from an abusive home i know 1st hand the terrifying feelings we have against the perpetrator. My father was a drunken, violent, sexually abusive moron (altho i do love him & forgive him i don’t respect him) As a child i feared the day he would actually kill my mother & even kill me (being the eldest i saw much more) & my siblings. The police were always at our home but always let him off with a warning …it’s beyond me why ? My mother eventually fled when i was 13 but he continued to harass & threaten my mum & me 😦 I eventually got old enough to stand up to him & he didn’t like it 1 bit …i was not afraid of him any more …he’d done his worst & i was still alive. Often confronting a bully will make them back down & fortunately in my case this happened …he went off with a very young woman & treated her like a princess & had a baby with her…go figure ! Anyway my point is not much has changed from then till now unfortunately 😦 The police continue to bury their head with this issue instead of confronting & jailing the bullies (& let me say there are both men & women bullies) They need to know it’s unacceptable to do this to another human being …. FULL-STOP. & as for the poor little children who get stuck in the middle of these so called ”grown ups” my heart goes out to them as i know the horror & terrified feelings they go through with these creeps! They are the 1’s who my prayers go out to.